Believe it or not, an active father has more influence over a young girl than any other man in her life. Take advantage by getting involved. Popular culture does not have the best interests in mind for your daughter. As a father, it’s your job to help her navigate life’s treacherous waters by being her hero. Every man who enters your daughter’s life will be compared to her father. Make sure she has a model example. So she doesn’t end up being a spoiled brat, teach your daughter humility. This will make her both happy and balanced in life. Protect and defend her, especially from herself as a teenager, and use a shotgun if necessary. The world is a lot less scary for daughters if they know their father will fight for them. When times get tough, don’t worry so much about how or why your daughter is the way she is. Be more concerned with how you can help her succeed. Be the kind of man you want your daughter to marry. (Redundant. See also chapter 3). Highly religious teens do better in life than less religious ones, according to a 1993 U.S. Department of Health study, cited in the book. This isn’t to say non-believers are disadvantaged as adults. But without afterlife hope, children are less motivated than adults, Meeker argues. Do with that what you will. Teach your daughter how to fight and say no. Otherwise she’s at risk of pleasing everyone, at the expense of herself at times. Connect with your daughter as often as you can, like throwing her up in the air, taking her to the movies, or even letting her hang around as you develop your own interests. For its concise sentences and scientific approach to raising daughters, I give Strong Fathers, Strong Daughters three stars out of five. 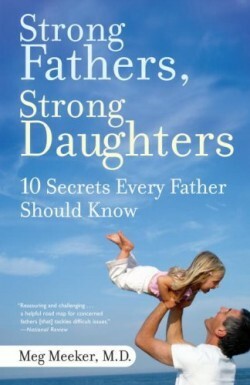 Recommended to any father seeking additional help in raising daughters. I finished this book earlier this year and it ruined me in a good way. I highly recommend it to anyone with daughters. I also found the scientific evidence behind abstinence until marriage fascinating. Blake, bring this book to NYC if you remember. I would like to look through it. I have always believed that a girl’s confidence reflects the type of relationship she has with her father. Sounds like a good book.